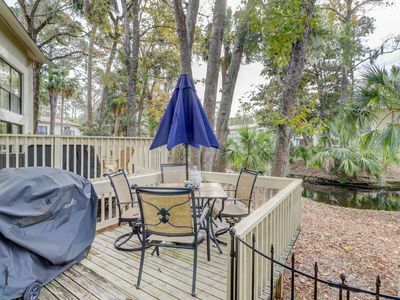 Experience your very own Palmetto State paradise at this cozy 1-bedroom, 1-bathroom vacation rental condo in the heart of Hilton Head. 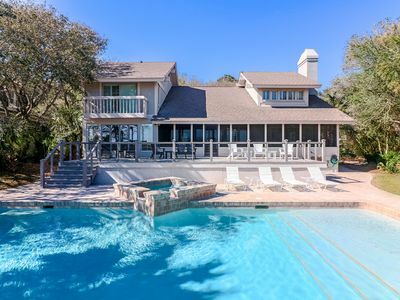 Located in the Hilton Head Beach & Tennis Resort, home of the largest beachfront pool on the island, this home for 6 is perfect for those looking to soak up the southern sun. 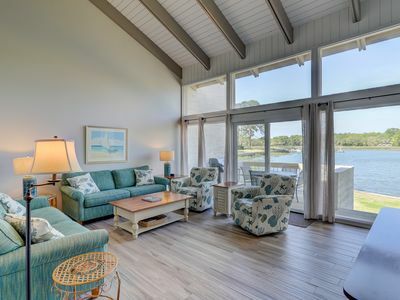 After a day of lounging on the beach, exploring Shelter Cove, or hitting the links, you'll look forward to relaxing with a cocktail on your private balcony overlooking the beach. 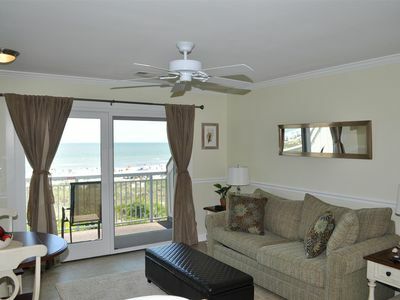 This home's spacious living area is sure to be a great place to unwind after a day at the beach. 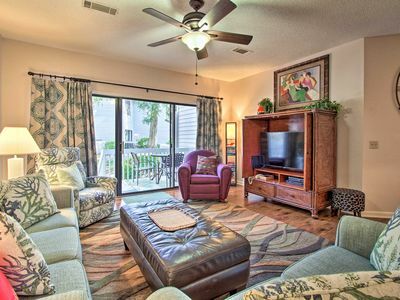 Whether you choose to watch the flat-screen cable TV or simply enjoy the views through the sliding glass doors, you'll be living the epitome of southern comfort. 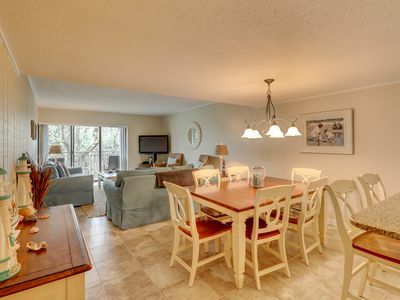 As you gather around the indoor dining table for 4 or quaint balcony table, you're sure to be impressed by the 5-star fare your group's chef whipped up in the fully equipped kitchen. When it's time to call it a day, head into the master bedroom and luxuriate on the plush queen bed. Can't fall asleep? Turn on the flat-screen cable TV and let the sounds of late night reruns act as a lullaby. 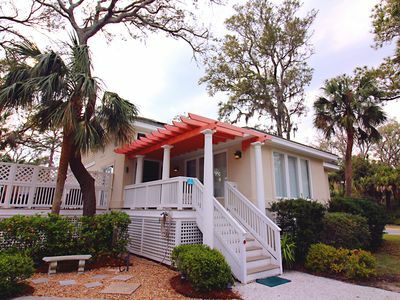 Once your little ones have emerged well-rested from their twin-over-twin bunk bed, head downstairs and enjoy Hilton Head Beach & Tennis Resort's community amenities. 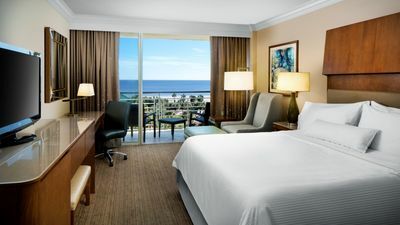 With access to the largest beachfront pool on the island, 10 hard clay tennis courts, a pool bar, hot tub, 3 restaurants, a fitness center, charcoal grills, bike rentals, and more, you'll feel like you're staying in a luxury all-inclusive resort. 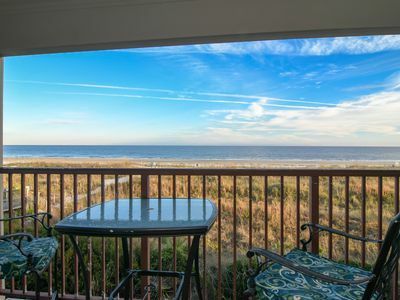 Grab your bathing suit and spend a day on the soft white sands of Hilton Head Island Beach. 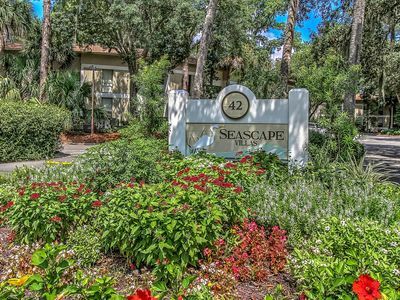 Located just a short walk from the condo, this family-friendly beach offers swimming, boogie boarding, sunbathing, and much more! Prefer hitting the links to hitting the beach? Head less than 2 miles down the road to Port Royal Golf & Racquet Club and channel your inner Jordan Spieth. Rated in the "Top 75 U.S. 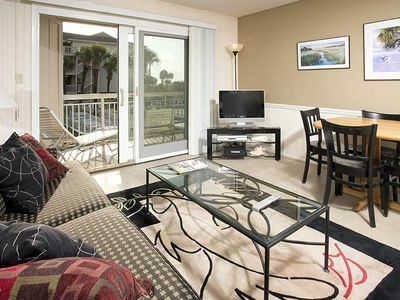 Golf Resorts," Port Royal offers 3 beautifully manicured courses for golfers of all levels. When you don't feel like cooking, be sure to check out some of the area's top-notch eateries. 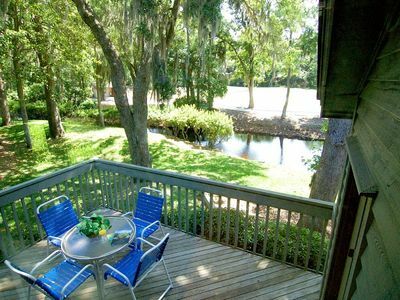 Whether you choose to bike to The Lucky Rooster for great southern fare and service or drive 6 miles to A Lowcountry Backyard Restaurant for life-changing fried green tomatoes, you're sure to return home full and happy. 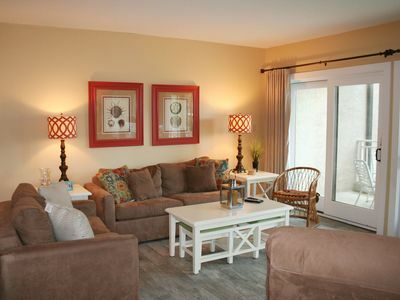 Shelter Cove Towne Center, sitting just 7 minutes from the condo, is a great place to spend a family afternoon. In addition to great shopping and dining, this 290,000-square-foot complex hosts frequent events like movie nights and bocce tournaments. 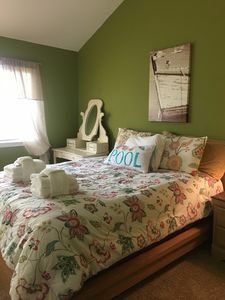 - Amenities include a fully equipped kitchen, furnished balcony, ocean views, free WiFi, 2 flat-screen cable TVs, open lot parking, beds for 6, and more! 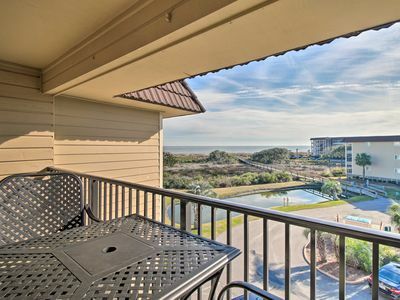 - Hilton Head Beach & Tennis Resort's community amenities include the largest beachfront pool on the island, 10 hard clay tennis courts, a pool bar, hot tub, 3 restaurants, a fitness center, charcoal grills, bike rentals, and more! 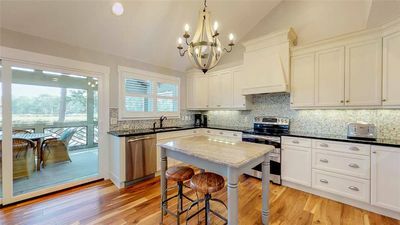 1606 Port Villa - Stunning views of Braddock Cove & Steps to the Marina. 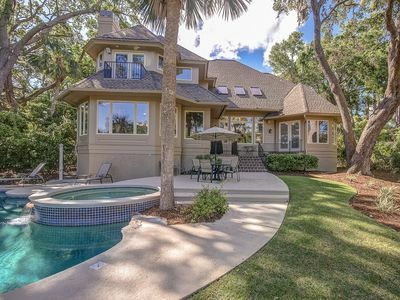 Stunning Four Bedroom Hilton Head Island vacation rental! 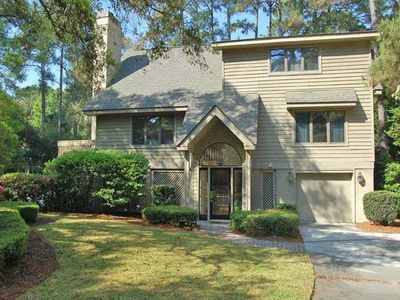 This 2 bedroom, 2 bathroom home away from home nestles up to the Shipyard Golf Course. 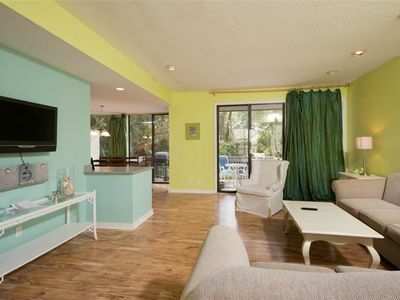 Bright villa close to the beach with Lagoon views! NEW! 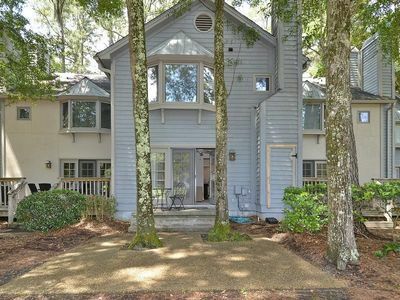 Updated Hilton Head Townhome - Walk to Beach!